The following is a condensed excerpt from the new book Confessions of a Successful CIO: How the Best IT Leaders Tackle Their Toughest Business Challenges (Wiley CIO Series, 2014) by Dan Roberts and Brian P. Watson. The book tells the stories of nine world-class CIOs, focusing on the most daunting challenge they ever faced—and how the lessons they learned have shaped their leadership styles and philosophies. I know Dan and Brian. This is solid work that deserves a good reading and then a re-reading. Congratulations to them both for making this happen. Most books in this category focus on a theory—very smart people espousing their ideas about the CIO role, how it will change, what current and aspiring IT leaders must do to succeed. Those books are valuable, and they provide an inordinate amount of useful, actionable ideas for today’s IT leaders. We might have our own ideas about those things, but we thought it best to leave the theory to smarter folks. We came up with a different approach: Find the best CIOs in the United States—arguably, in the world—and tell their stories. What do we mean by “stories?” It’s relatively simple: We asked these respected, acclaimed IT leaders to walk us through the toughest business challenge they’ve ever faced, how they tackled it, and what they learned from it. The stories we heard—and that you’re about to read—are, simply put, awe-inspiring. We’ve been working with or writing about IT leadership for more than 35 years combined, but the stories in this book were beyond what we expected—and will continue to amaze for a very long time. We could just go to the top Fortune 500 companies and interview their CIOs, but we decided, in this case, that size doesn’t matter. Sure, some of the CIOs in this book come from large companies, household names, or recognizable brands, but that’s not what got them here. What got them here is simple. They’re leaders, not techies. They talk business, not bits and bytes. 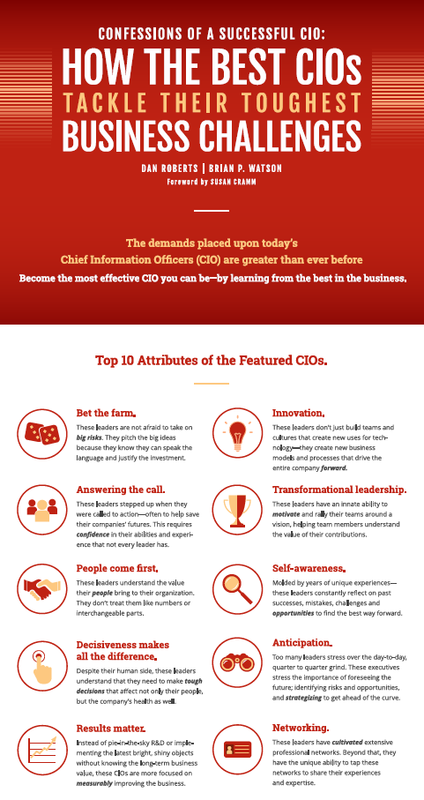 The CIO of today—and most certainly of the future—needs to navigate the C-suite the same way the other occupants do. Pride in the function is commendable, but not if it stops there. So, in the end, maybe there is a theory. The best IT leaders do all those things. And by telling their stories, we hope that the current and future generations of IT leaders will use these case studies to learn, to teach, to inspire, and to elevate our profession to higher, more game-changing levels.